Product market fit means being in a good market with a product that can satisfy that market. Getting there is the hardest challenge your start-up faces. The following is a guest post by Garrett Moon, co-founder of Todaymade, and CoSchedule, an editorial calendar for WordPress, about how he worked with paying customers to ensure he was solving real problems while developing his product. Just last week, my team launched CoSchedule. The launch was a success, but it was hard-earned after nine months of constant feedback and idea validation. You see, we didn’t wait until launch to see what our users thought. We started gathering feedback early. 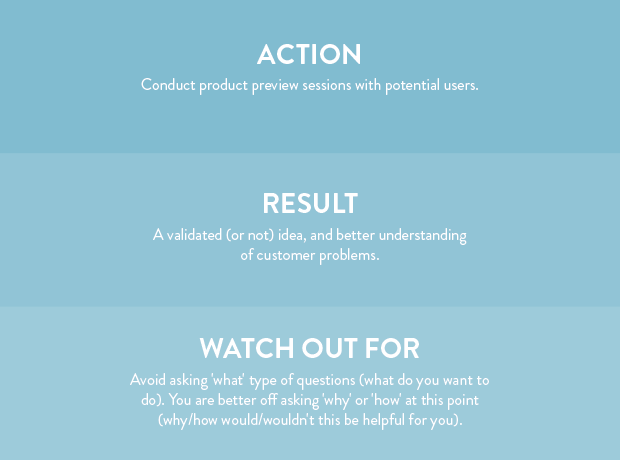 There’s a lot of talk out there about idea validation and the process of finding product-market fit. Trial and error is crucial, but the goal for most startups is to launch with a validated idea that customers immediately flock to. This can be done with a continuous cycle of feedback with the customer, much like the lean startup “build, measure, learn” approach. 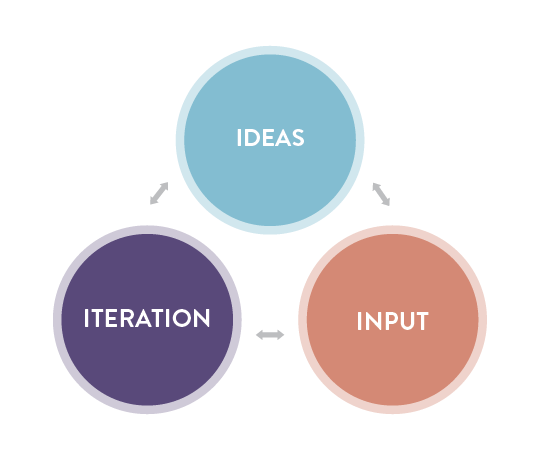 I like to think of it as the three I’s — ideas, input, and iteration. The fist step is to do as much as you can to validate or reshape your original idea. In the beginning, our idea was fuzzy at best, but we drafted a few mockups, threw together a quick sign-up page, and made a small AdWords buy. A few blogs picked up on our landing page and shared it with their audience. This gave us a good base of potential users that we could engage for idea validation. We began the validation process by conducting 10 product preview sessions where we walked potential users through a series of product mockups. Each of these sessions were recorded, and shared with the entire team. This step was crucial. It helped us identify the real problems that we needed to solve and helped shift and mold our idea almost immediately. We validated our idea, and modified it based on our early feedback. 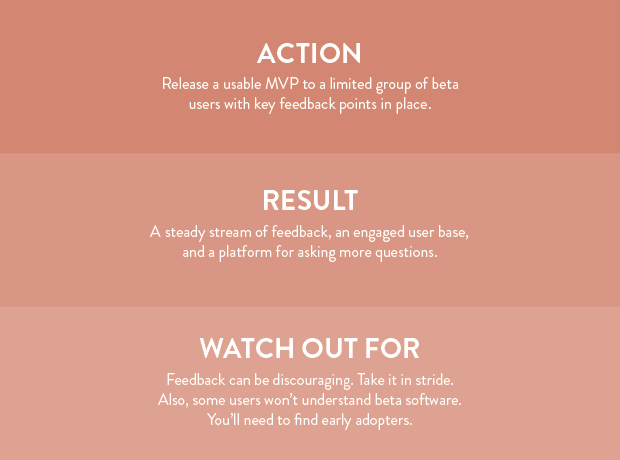 The next phase in our process was to launch a minimum viable product, commonly referred to as an MVP. It was literally the most basic thing we could come up with, but it allowed us to put a working idea into our customer’s hands. We included Intercom (an essential tool) in the release, and regularly asked for feedback using a series of surveys and automated in-app messages. This created a continuous stream of input while we were building the real thing. Overall, this phase taught us a lot about who our customers were, and who they were not. It also stung a bit at times. Des, here at Intercom, has a great post about overcoming some of the fears associated with real feedback. They are real, but so worth overcoming. In addition to the feedback cycle, this step engaged our users in the product and began investing them into the final vision. Later, this would prove to be a nice catalyst for future sales. One of my favorite quotes is from Amazon.com founder Jeff Bezos. While addressing the employees of the Washington Post after his recent acquisition, Jeff said that the plan for going forward was to be stubborn on the vision, but flexible on the details. 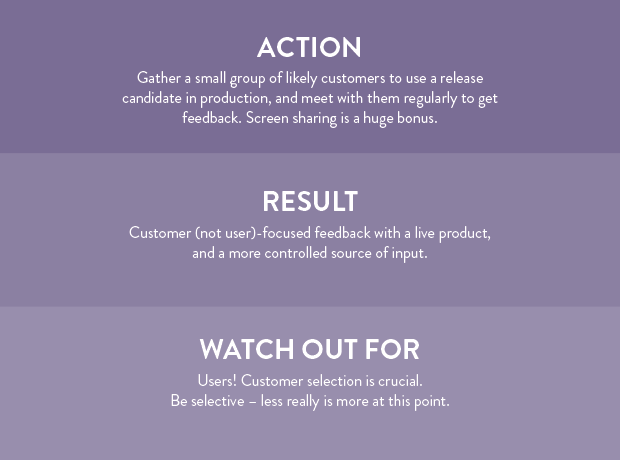 This is the exact approach that we need to take with our feedback. One of the big gotcha’s in customer feedback is to resist feature creep. Once we get feedback coming in, we not only need to iterate on it, but to also evaluate it to make sure that it is in line with our true audience. We need to build to support our customers, not all users. Customers are the ones who pay for your product. To do this, we initiated a CoPilots program that included a select group of people that we deemed “highly likely to purchase” after launch. This core group agreed to use the product in a production environment and provide weekly feedback via Google+ Hangouts in exchange for free use of the product. It was a win for everyone involved. As a final tip, I would say that we need to make the entire team a part of this entire process. Although time consuming, keeping all team members on level with your users is a good thing. We recorded, reviewed, and digested most interviews and even re-watched them at key points during development. You will never go wrong including your entire team. For the SAAS market, the idea, input, iteration loop is a cycle that never ends. More From Garrett: Follow Garrett on Twitter, or read the CoSchedule blog.